From the outside Bagni di Pisa might look a little unassuming. 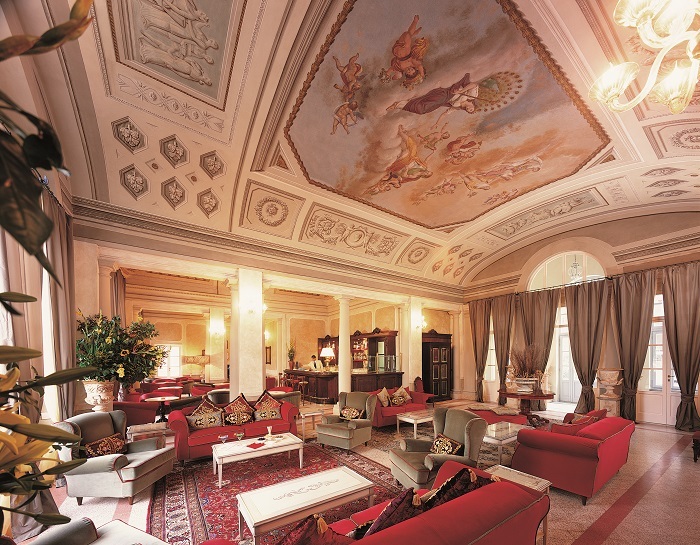 But step through the front door and you enter a world of fine Italian luxury, draped in history, offering some of the best hospitality the country has to offer. Formerly the 18th century summer residence of the grand duke Francesco Stefano of Lorena, the property has been transformed into a magnificent spa resort by its new owners, Italian Hospitality Collection. 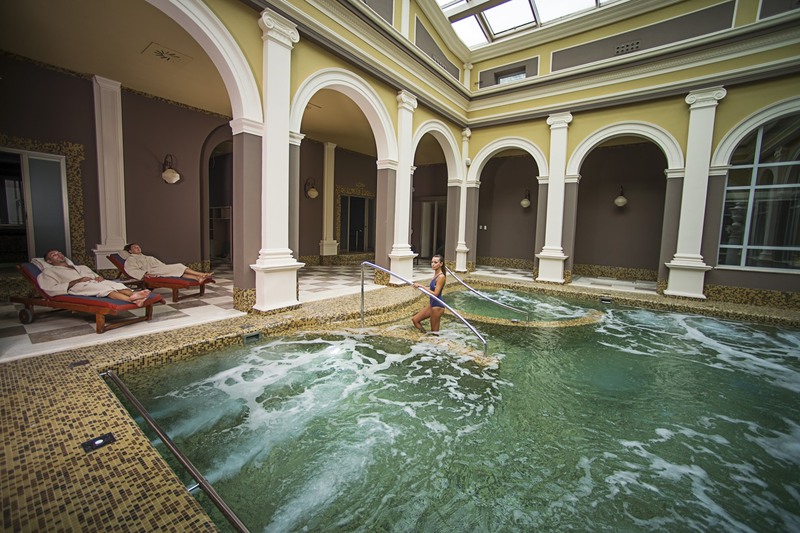 A member of The Leading Hotels of the World and a previous winner of the Italy’s Best Hotel Spa title at the World Spa Awards, the hotel lies above natural hot springs and its ancient thermal pools are renowned for their healing properties. After spending a couple of nights at the nearby Grotta Giusti, and being dazzled by what was on offer there, I arrived for a two-night stay late last month and was blown away all over again. On the outskirts of Pisa, the hotel is a short ride from the centre of town, but many visitors will likely decide to spend as much time as possible within the gilded walls. Immersed in the greenery of the Parco degli Ulivi, Bagni di Pisa has been brought back to its former splendour and the frescoed hallways, Tuscan terracotta and marbled floors evoke a time when European royalty called the place home. On arrival we are guided to our room – and it is hard hide our unfeigned delight from the hotel porter. 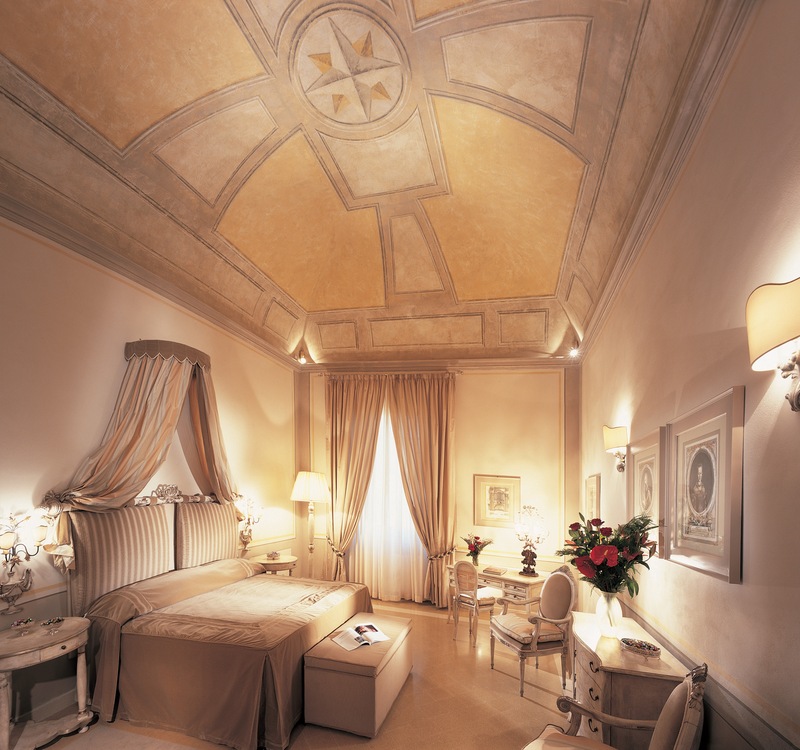 The ceiling of our suite towers above us, adorned with an original 19th century fresco, while the expansive double bed covers a mere fraction of the floor space. Views through the windows capture the true beauty of the Tuscan countryside, as well as offering glimpse of the famous Leaning Tower in the distance. Parqueted floors, Tuscan earthenware and attractive bathrooms in Carrara marble complete the look. It is hard to overstate the magnificence of the rooms at Bagni di Pisa – this is the authentic original countless others around the world are imitating. “When we took on the property we discovered the frescos in some of the rooms which were not open to the public,” explains Laura Gualtieri, sales manager at Bagni di Pisa. “When we renovated the property, we knew what we had was incredible and now the frescos make up a big part of the property. There are just 61 rooms in the hotel, including 11 junior and nine standard suites. While it seems plain rude to leave such magnificent accommodations, the hotel is centred on a vast natural spa which specialises in holistic healing, weight loss, detoxification and relaxation. Set between healing hot springs to the east and baths of Mount San Giuliano to the west, Bagni di Pisa seeks to offer the complete experience of physical and mental cleansing. Downstairs there are two spa areas, offering everything from a salt water pool – allowing guests to float as though on the Dead Sea – to indoor and outdoor thermal pools, a Turkish bath, and a space for mud treatments. The water flows at a natural temperature of 38°C and is rich in sulphate, calcium and magnesium, as well as being completely free from any chemical alterations. Floating in the immaculately tiled pools it is possible to forget the world outside and succumb completely to the soothing embrace of the hotel. 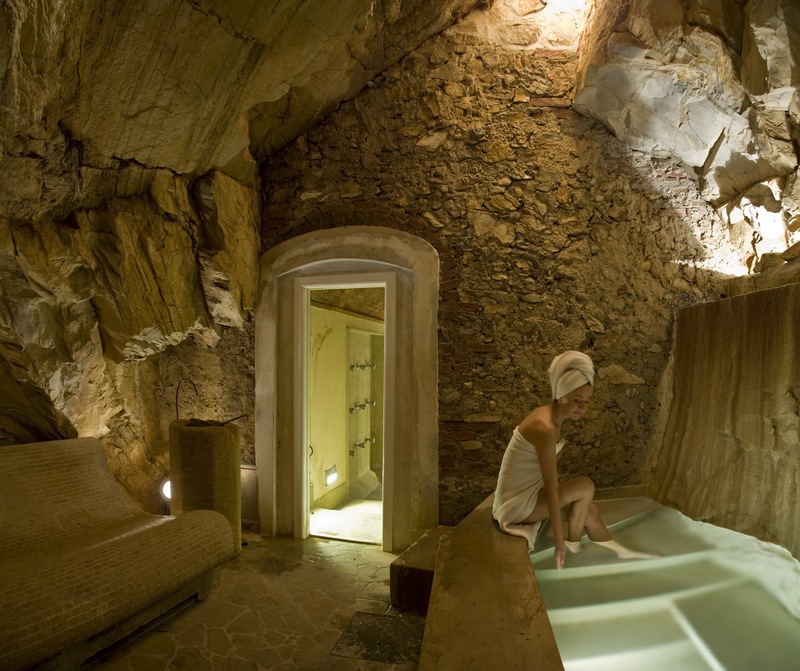 In a unique flourish, Bagni di Pisa also offers the Cave of the Grand Dukes – a natural steam room. Here water cascades from a small waterfall, creating a warm and humid environment that helps stimulate the senses. The atmosphere is also believed to help regulate blood pressure and eliminate toxins through heavy perspiration. “Our Italian guests appreciate the historic side of the hotel – everywhere in Italy there is a lot of history – but they also come for the spa. “It is a special spa for them and they enjoy that,” adds Gualtieri. “For international tourists, the area is a big plus. We have Pisa just on the doorstep and a lot to offer. “We have a lot of Russians visiting, as well as Europeans from France, Germany, and the UK, as well as Americans. Once you are fully refreshed, there is still plenty more to explore. On the second floor is the elegant Bar Shelley, an ideal location to enjoy a cocktail while surrounded by charming décor and magnificently restored frescoes. As a marvellous example of a wedding reception hall from the early 19th century, it now operates as an exquisite lounge, allowing guests to relax before being called to dinner. And what a dinner it is. The Dei Lorena Restaurant, presided over by chef Umberto Toscano, offers a menu of traditional wholesome flavours, matched with innovative low-calorie cooking to create an experience in keeping with the ethos of the hotel. Surrounded by elegant interiors and a charming ambience, we were able to indulge in some of the most outstanding creations while enjoying unmatched views over Pisa. Each of the elements of the hotel also forms part of the wider Equilibrium programme. Based on four key cornerstones - nutrition, thermal treatments, anti-stress techniques and physical exercise - the regime reaches across the Italian Hospitality Collection portfolio to assist guests in finding a deep sense of relaxation. Through the microbiota diet, the programme helps establish and maintain a balanced microbial community, while thermal treatments have powerful anti-inflammatory effects. Breathing-based anti-stress techniques help participants to manage their emotions and rebalance the autonomous nervous system, while physical exercise boosts the body’s ability to adapt to stress-inducing stimuli. “The programme helps guests to change their lifestyle – it is not only about dieting while you are here, but we teach you to continue how to grow even after you leave. “We aim to teach how to live healthy, while also having a social life. “We see a lot of people who are on a diet must sacrifice their social life; here we try and combine healthy living with a social life,” adds Gualtieri. After dinner, guests are invited to take a stroll up Percorso Vita walkway, through the terracotta arcades embellished with citrus trees, among the scent of olive trees and the beauty of the botanical garden. Here we discovered the Kaffeehaus, renowned for being a favourite destination of the empress Maria Theresa of Austria who used to come here to read poetry. 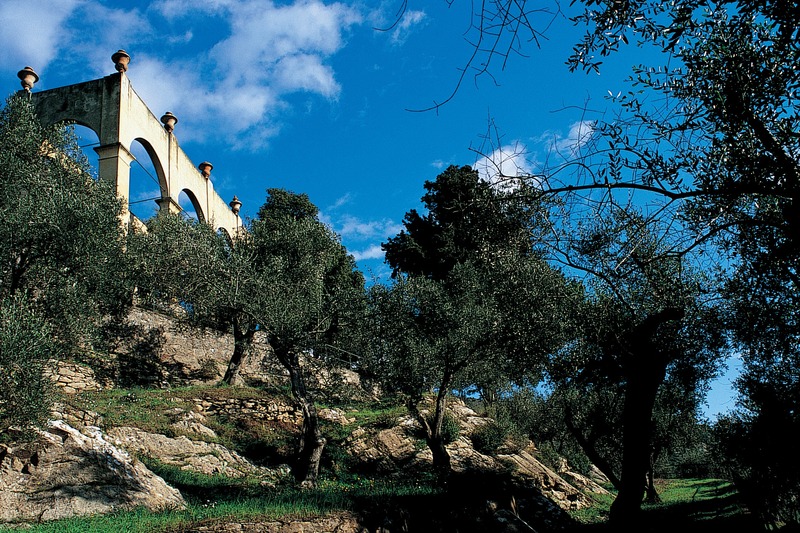 Gazing over the city below, it is easy to see why countless generations have marvelled over the beauty of Tuscany. Created in December 2014, the collection aims to be ambassador of the Italian culture, art and nature, with its range of exclusive hotels.